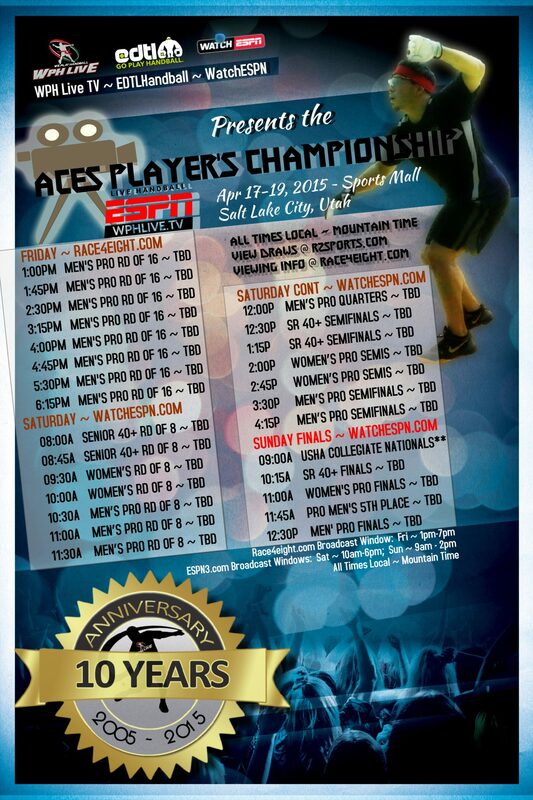 The Broadcast Schedule is out for the big season finale of the Player’s Championship in Salt Lake City, Utah, next weekend. This is our last showing with ESPN; closing out an amazing year of handball on the Race4eight Tour. In case this was a one-shot deal w/the network in Bristol, please help us get as many viewers as possible. This Broadcast will feature the game’s best players: Brady, Moreno, Lenning, Alvarado, Fink, Ortiz, Peixoto, Cordova, plus a very talent field of qualifiers: Ireland’s Tom Sheridan/Stephen Cooney, Marcos Chavez, Vic Perez, Abe Montijo, Anthony Selestow, Luis Cordova and… Women’s best, like Catriona Casey, Aisling Reilly, Martina McMahon, Tracy Davis, Ashley Moler, Danielle Daskalakis, Jessica Gawley and more! The 40+ Senior Pros will get some airtime too, with Andy Schad, Dan Zimet, John Bike, Dan Armijo, Marcos Chavez, Tom Sheridan and Chris Watkins to name just a few, on the show court. In all, the very best in the game are here and you can watch live on ESPN & the WatchESPN App. You can catch the action at www.race4eight.com as well, with the WPH Live TV video player & ESPN Video App Embedded right in-page (plus player rankings, press releases, news stories, video previews, et al). Just use your tabs! Any more info or have problems viewing? WPH All Access Pass Holders and Supporters can receive alternative viewing options. Contact us: wph@race4eight.com. To Share the PDF Broadcast Schedule, Print from HERE in PDF.